The NBA playoffs have arrived and the takes are burning. Will Golden State regret getting its playoff wish granted to face the Clippers? Can Giannis Antetokounmpo and the Bucks continue to look like the team to beat in the East? The Crossover delivers the biggest questions for each first round series. While the Western Conference playoff teams have been set for a while, playoff seeding took until nearly the last game of the regular season on Wednesday to be finalized. With some last-minute shake-ups and the Pistons grabbing the last spot in the East, the 2019 NBA playoff matchups are set. In the East, No. 1 Milwaukee will face No. 8 Detroit, No. 2 Toronto will face No. 7 Orlando, No. 3 Philadelphia will face No. 6 Brooklyn and No. 4 Boston will face No. 5 Indiana. In the West, No. 1 Golden State will play No. 8 LA Clippers, No. 2 Denver will play No. 7 San Antonio, No. 3 Portland will play No. 6 Oklahoma City and No. 4 Houston will play No. 5 Utah Jazz. With the countdowns to Game 1 in full swing, these are eight burning questions—one for each series—that will define the postseason. (1) Bucks vs. (8) Pistons — Will the Bucks continue to look like the team to beat? Giannis Antetokounmpo has not yet won a playoff series, but the Bucks’ first-round matchup against the Pistons may likely provide the first of many. In a battle of coaches in their first year with their new teams in Mike Budenholzer and Dwane Casey, the Pistons may find themselves without leading scorer Blake Griffin as he battles a knee injury. Griffin is at the forefront of Detroit’s identity, and the Pistons do not have a clear advantage over the Bucks without him. The combination of Griffin and Andre Drummond in the frontcourt may pose problems for the Bucks, but likely will not make too large an impact against Antetokounmpo and the team with the top record in the league. 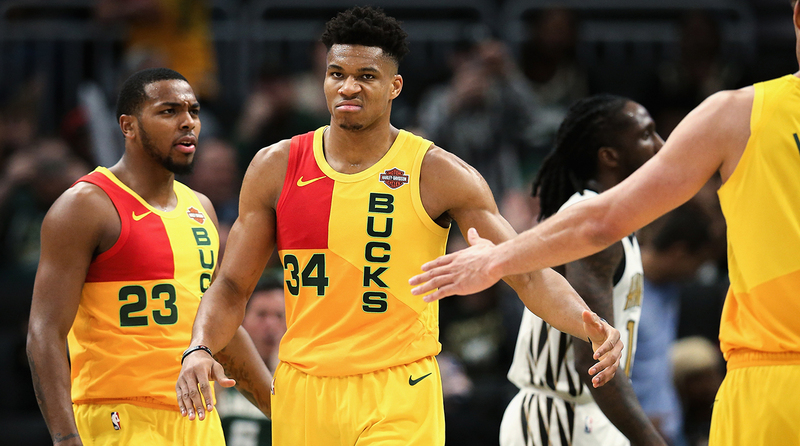 The Bucks swept the teams’ regular season series 4-0, where the Bucks’ league-leading defensive rating was on full display with a point differential of +7.3. The Bucks have earned homecourt advantage throughout the playoffs, and a well-rested leading lineup must take care of business against the Pistons behind MVP candidate Antetoukounmpo. With Griffin banged up, Detroit will have a difficult time matching up to the Bucks, but a healthy Griffin may pose problems for the Bucks in their quest for the second round. (2) Raptors vs. (7) Magic — Who will win the frontcourt battle? The Raptors again find themselves near the top of the East, this time with a reworked team and coaching staff. To start the road in fighting for the East’s crown, Toronto will first have to get through a team it split a series with this season. Toronto should not have trouble with this first-round series, but an area Orlando has been competitive with the Raptors this season is withholding its frontcourt stars and leading scorers. First, Aaron Gordon has been effective in defending Kawhi Leonard this season, limiting him to 18 points per game in the three he’s played in, down from his 26.6 average, his second lowest against any team he’s played more than once this season. Meanwhile, Jonathan Isaac has held back Most Improved Player candidate Pascal Siakam, limiting the forward to 8.8 points per game and 34.2% shooting against the Magic, down from his average of 16.9 points and 52.9% shooting, which are the lowest totals against any team this season for Siakam. The Magic, in its first playoff series in seven seasons, have ridden the hot hands of Nikola Vucevic and Terrence Ross in their two wins over the Raptors this season while holding the league’s best defensive rebounding percentage (76.9%). Toronto may have Orlando out-matched in terms of talent, experience and pushing the pace, but they will have to work through its frontcourt and defense to give the Raptors a run for their money. (3) 76ers vs. (6) Nets — Can Brooklyn’s bench be its secret weapon? Yes, the Nets are going to have a challenge to counter Joel Embiid (if he’s healthy) in the paint. But where Brooklyn can exploit and upset the Sixers is with the versatility of its bench and guard play. Of Brooklyn’s top five scorers, three come off the bench. Led by Spencer Dinwiddie, Caris LeVert and DeMarre Carroll, the Nets rank second in the league in bench scoring at 47.8 points per game compared to the Sixers bench’s 31.7 points, ranked 27th. Brooklyn’s bench will especially be forced to step up as Ben Simmons will apply pressure against Nets’ leading scorer D’Angelo Russell, expecting to limit his production. The Sixers have the skillset to edge the Nets, but that hinges on whether Embiid’s left knee soreness keeps him out of the lineup. Embiid provides a threat difficult for the Nets to counter, as they found out in team’s most recent battle, a game that saw Embiid put up 39 points and 13 rebounds in a Sixers win. But as the teams split their regular season matchups, the Nets found themselves led by Dinwiddie off the bench, who averaged 23.8 points per game against Philly this season, and strong three-point shooting (fifth in the league at 34.1%, compared to the Sixers’ 28.8%). Russell is a wild card in his first playoff series and the Nets’ unexpected first playoff berth since 2015, but he has been the hot hand for the Nets and has been known to shoot the team into victory this season. As the Nets await Embiid’s status, their three-point shooting, bench advantage and clutch play may be enough to make the series interesting. (4) Celtics vs. (5) Pacers — Which team will be least impacted by injuries? Both the Celtics and Pacers have been familiar with the injury bug this season. Indiana first lost Victor Oladipo to a season-ending leg injury on Jan. 23, and now the Celtics are without Marcus Smart for four to six weeks with a torn left oblique. Losing Smart is a painful loss for Boston. He has been at the forefront of the team’s defense and is one of its top leaders, while also taking a jump in his shooting numbers this season. The Celtics will be without a critical piece of what has made a top-six defense in the league, and will have to go against a team in the Pacers with the third-best defensive rating in the NBA. At least for this series, Boston should be fine without Smart. The Kyrie Irving-led Celtics should have the offensive power to counter Indiana’s defensive lockdown. While Domantas Sabonis and Myles Turner provide large threats in the paint, Indiana has been known to struggle on the glass. Aron Baynes and Al Horford dominate the boards for Boston, and the Pacers cannot afford to give up offensive rebounds to a Celtics team that feeds off second chances. Boston has a 3-1 edge in the regular season matchups, with Indiana’s win coming coming before Oladipo’s injury. Indiana’s leading scorer in Bojan Bogdanovic had just four points in the teams’ most recent duel, a game Boston won by 20, and the Pacers need more from him to have a shot at keeping this series competitive. The Celtics’ two recent wins against the Pacers have shown their comfort, but it comes down to whether the team can adjust without Smart as the Pacers navigate the postseason without Oladipo. (1) Warriors vs. (8) Clippers — Will Golden State regret getting its playoff wish granted? The Warriors made it clear who their preferred playoff matchup was, and they got their wish. By being paired with the L.A. Clippers, the Warriors get to stay close to home for its first round of the playoffs. But will the wish pay off on the court? The Warriors have fared well against the Clippers this season, even though L.A. nabbed an OT win before trading Tobias Harris. 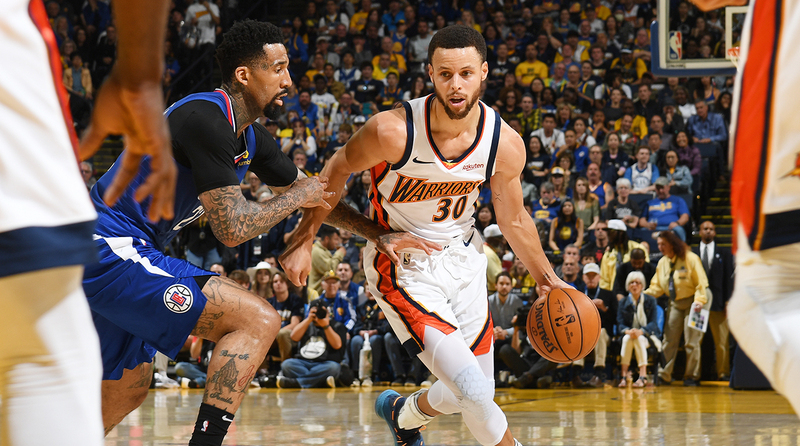 Meanwhile, Steph Curry averaged 32.8 points in three games against the Clippers, and Kevin Durant added 27 points per game in his four matchups against L.A.. Meanwhile, the Clippers have an advantage with the league’s top bench, averaging 53.2 points per game while being led by the versatile Lou Williams. That has helped make up an impressive season for the Clippers in a year many saw the team to take a step back after the Harris trade, but pieces such as Williams and Montrezl Harrell provide a counterpoint to the Warriors’ league-leading offense. Golden State may also grow to regret its playoff wish due to the on-court dynamic between Patrick Beverley and the Warriors. The two sides have had tension since Beverley tripped Curry in Game 1 of the first-round playoff series between the Warriors and Rockets in 2016. Curry took it as intentional, and the teams got into a shoving match. The two sides have continued to show distaste for each other, as shown in the teams’ matchup on Dec. 23 in Oakland, where Beverley and Curry got into another confrontation. This series may end up being one-sided, but Beverley and Curry will surely do their best to get under each other’s skin. (2) Nuggets vs. (7) Spurs — Will Spurs’ experience threaten Nuggets landmark season? After six years out of the playoffs, the Nuggets have a favorable schedule awaiting them if they can get past the Spurs in the first round—but that is a big ‘if.’ While this will be the first playoff series for many of the Nuggets, the Spurs find experience behind LaMarcus Aldridge, DeMar DeRozan and, of course, Gregg Popovich. Denver, the second-youngest team in the NBA, has had a season to remember led by Nikola Jokic. Spending most of the season swapping spots with the Warriors for the top seed in the West, the Nuggets more so were lackluster in the last month of the regular season and settled into second place. What has made the Nuggets successful this season was an all-around performance from Jokic, who leads the team in points, rebounds and assists. Jokic’s 7.3 assists per game help give the Nuggets the league’s second-highest assists-per-game average (27.4). Denver is also top-10 in offensive, defensive and net rating in the league. While this will be DeRozan’s first postseason with the Spurs, Popovich, in his 22nd straight postseason, cannot be underestimated. Nuggets coach Mike Malone said it best: “Gregg Popovich has five rings. I have a wedding ring,” and despite the Spurs being seventh in the West, they are sixth in the league in offensive rating. Both teams won their home matchups in the regular season series, and overall had some of the best home records in the NBA (34-7 for Denver, 32-9 for San Antonio). If the Spurs can overcome their hurdle of poor play on the road and steal one in Denver, there is not much that can hold them back from taking over this series. (3) Blazers vs. (6) Thunder — Can the Thunder stay present in quest to upset Blazers? The Thunder were in third place in the West at the All-Star break, but find themselves in a tantalizing spot in the sixth seed against a Blazers team that they swept during the regular season. What may peak Oklahoma City’s interest even more is what lies ahead—a route to the Western Conference finals that would not involve going through the Warriors, Rockets or Jazz. It’s a prime opportunity for either team, and a matchup that is bound for a competitive series. Oklahoma City is a roller coaster in how its jumped and fallen in the standings this season, and in its inconsistent offensive play, but the Thunder are strong defensively; they hold the fourth-best defensive rating in the league, with Russell Westbrook and Terrance Ferguson as the anchors. The Blazers, on the other hand, hold the fourth-best offensive rating in the league, led by Damian Lillard and now-injured Jusuf Nurkic, who Portland has missed up front. While the Thunder may feel like they can take advantage of a Nurkic-less Blazers team, they cannot afford to look past the first round. C.J. McCollum and Lillard both can go off for Portland, as seen in Lillard’s 51 points in the Blazers’ OT loss to the Thunder on March 7. Oklahoma City has two scoring threats in Westbrook and Paul George, but each can go cold. The Thunder will have to find consistency and use its defensive prowess to upset the Blazers, but the opportunity that awaits each team in future rounds is a motivator that may cause one side to lose its focus in the first round. (4) Rockets vs. (5) Jazz — Can the Jazz get playoff revenge against the Rockets? A battle of elite offense in Houston vs elite defense in Utah will make for quite the spectacle in the middle of the West. It is also a matchup of the league’s two hottest teams, as the Rockets and Jazz hold the NBA’s best and second-best record and net rating since the All-Star break, respectively. To add to it, the sequence of events that had to take place for these teams to meet in the first round did not seem possible—including two buzzer-beaters, a 28-point comeback by Portland and a double-digit comeback in the last five minutes by the Nuggets—but here they are. This matchup allows the Jazz to get revenge against the Rockets from last season's Western Conference semifinals, in which the Rockets won in five games to then lose to the Warriors in Game 7 of the conference finals. While James Harden has put up another MVP-caliber season to lead Houston’s second-ranked offense, Donovan Mitchell has taken a step up offensively and Jae Crowder has been a key part of Utah’s second-ranked defense. Stopping Houston’s historic three-point pace will be key for Utah, and that is a strength for the Jazz, who allow the fewest three-point attempts and second-fewest makes in the league. The Jazz will also have to deal with Harden and Chris Paul in the mid-range, as they are known to create shots for themselves. With Rudy Gobert providing staunch protection in the paint and the Jazz pushing the perimeter to contest threes, Harden and Paul have been successful in the teams’ split series of figuring out the defense and finding ways to score mid-range. This series is near the top in what’s expected to be a competitive and thrilling matchup, and if Utah can adapt its top-notch defense to Houston’s fiery offense and three-point shooting, the Jazz can find themselves getting revenge for last year’s semifinals and making a run in this year’s playoffs.